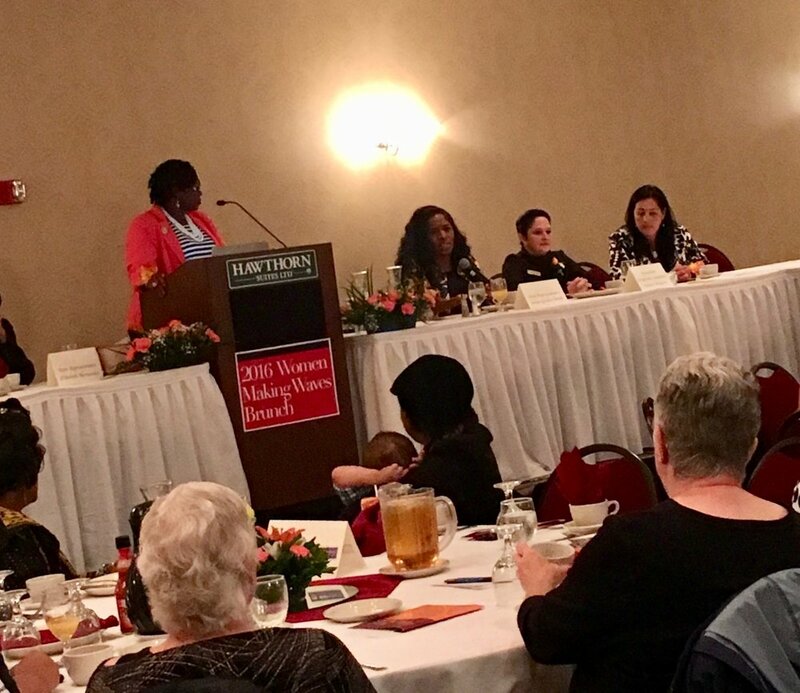 Congresswoman Robin Kelly, Congresswoman Cheri Bustos, State Representative Jehan Gordon-Booth, State Representative Elizabeth Hernandez, State Representative Cynthia Soto, and Comptroller Susana Mendoza. Thank you for joining me today. I appreciate your continued support of my candidacy. I am proud to say that my first legislative session has been a successful one. With the help of many local community organizations and activists, I have passed legislation to protect the Mahomet Aquifer (HB1326), expand higher education opportunities to minority students (SB2505), and lower the predatory cost of phone calls from Illinois prisons (HB6200). Unfortunately, I do have legislation that the Governor has vetoed. I plan to work hard this fall to get the veto override votes to bring automatic voter registration (SB250) to Illinois and ensure that our home child care providers are adequately trained in safety and first aid and appropriately compensated for the time they spend at those trainings (SB2536). In addition to a busy legislative schedule, my constituent services office has also been an integral part of a successful first term. We have assisted over 100 people in the last two years with individual issues, fielded hundreds of phone calls with requests for services and information, and held numerous educational events for community members. We also have a robust and crucial internship program. Since taking office in 2014, we have had over 60 interns assisting with all the work in our office: constituent services, event planning, social media, our community advisory legislative panels, and much more. Community Advisory Panels that over the last two legislative sessions have reviewed almost every bill before a House committee and provided me with valuable feedback on how the bill will impact the 103rd district, the state as a whole, and guidance on what questions to ask when a bill comes up for a vote. If you are not a member of one of our six subject-based advisory panels, please join us! You can find more information on my website, staterepcarolammons.com. Thank you again for your support. It has been an honor to serve as a state representative, and I am looking forward to being a part of Illinois’ 100th General Assembly this January. As for today, please enjoy the dynamic lineup of local, state, and national legislative leaders and activists for a discussion of policy, strategy, and the importance of having a strong representation of women in all levels of government. For over 30 years Linda dedicated her life to serving the Champaign-Urbana communities poor and at-risk families. As a visionary, her life’s mission has been to create solutions for and speaking on behalf of hurting families. In 1994, she began a grassroots movement advocating for children alleged to have been abused and/or neglected. She eventually founded Best Interest of Children, to promote alternatives through advocacy and education regarding the current foster care system. Drawing from her vast experience in guiding families, BIOC led the way for many current changes in the child welfare system in Champaign County. 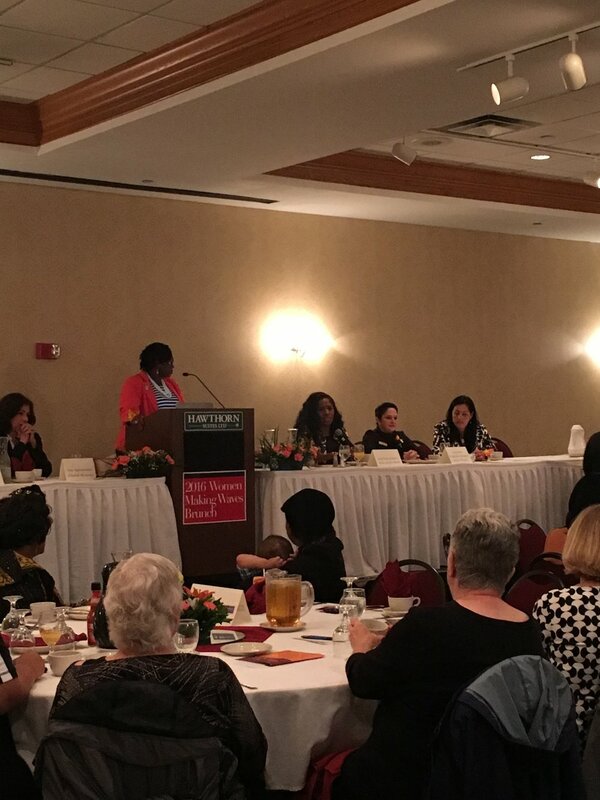 Linda’s leadership and tireless effort positioned Champaign County to be the site for the development and implementation of “Family Conference” a state-funded pilot program established to prevent children from unnecessary foster care placement. 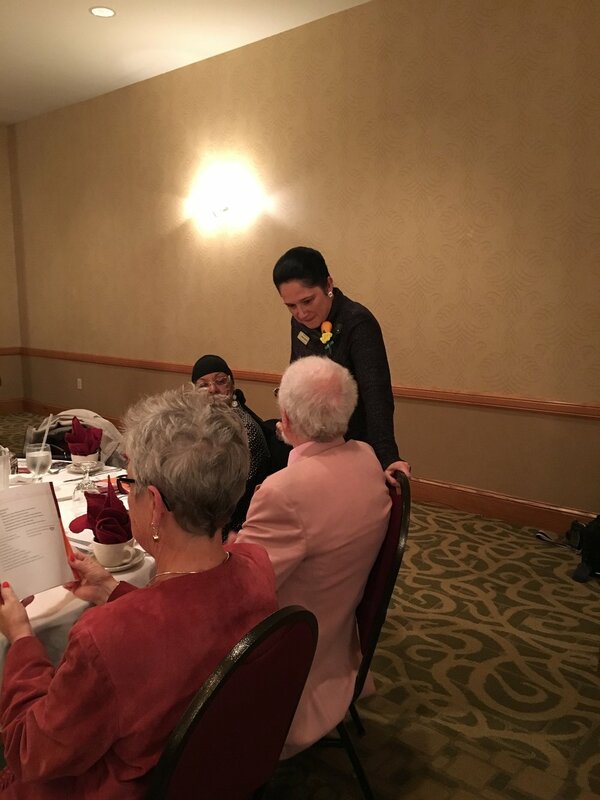 With Linda’s leadership and her passion for serving she was appointed by Governor Thompson as a delegate for welfare reform committee in Illinois. From 1999 to 2002 she served as Co-Convener of the Child and Adolescent Local Area Network (LAN#24) and the Chair of the Champaign County Board Welfare Services Committee. Linda has also served as Vice President of “SISTERS” a national organization established to help African American Women in need. In 2005 she was elected as the first African-American to serve as the City of Champaign Township Supervisor. In 2009 Linda retired from public office and is now serving the community in a volunteer capacity. Linda grew up in Decatur, Illinois, married over thirty years, and is the mother of two daughters, grandmother of six, and great-grandmother of one. Congresswoman Robin Kelly In a special election on April 9th, 2013, Robin Kelly was elected to represent Illinois’ 2nd District in Congress – receiving 70.7% of the vote after winning the hotly-contested Special Democratic Primary on February 26, 2013, with an overwhelming 53.3% of the vote in a 15-way race. Congressman Kelly began her career representing Illinois’ 38th District in the Illinois House of Representatives from 2002 to 2007. In 2007, Kelly left her position as Representative to take on the challenges of the Illinois State Treasurer’s Office. She was the first female African-American to serve as Chief of Staff where she worked for a progressive agenda founded in social and economic justice through an innovative investment strategy, encouraging small and local businesses, eradicating food deserts, and promoting financial literacy. Additionally, Kelly was essential in streamlining processes in the Treasurer’s Office that reduced expenses and advanced stronger ethical guidelines. Now, as a Representative in U.S. Congress, Kelly pushes forward those same positive, progressive agendas for her constituents in Illinois’ 2nd District. Robin Kelly has a long history of standing up to the NRA. She has fought tirelessly to ensure that proper and necessary gun control legislation is in place to protect the people of her district and the United States. Kelly attended Bradley University in Peoria, where she received her B.A. in psychology and an M.A. in counseling. Kelly also has a Ph.D. in political science from Northern Illinois University in DeKalb. Kelly serves as a Trustee of Bradley University. In addition to being an active member of the Sigma Gamma Rho Sorority Inc, she belongs to Bradley’s Centurion Society for honored alumni. Kelly serves on many boards and commissions including the Cook County Human Rights Commission, the Hate Crimes Commission, and is a board member for the Center for Tax and Budget Accountability. Kelly lives with her husband, Dr. Nathaniel Horn in Matteson. They have two adult children: Kelly and Ryan. Tammy Duckworth is running to represent Illinois in the United States Senate. Following her career as a helicopter pilot in the U.S. Army, Tammy worked as an advocate for Veterans at both the state and federal level. 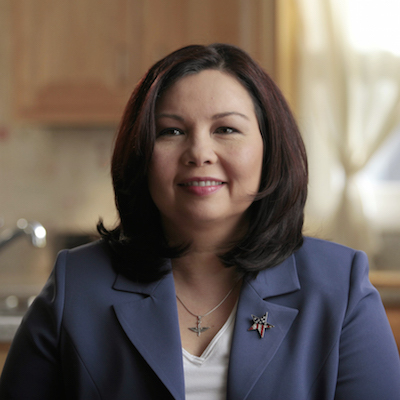 Tammy was elected to the House of Representatives in 2012, where she has been an active voice for Illinois families. Tammy was living in DeKalb, Illinois, working at Rotary International while pursuing a Ph.D. at Northern Illinois University, when her unit, headquartered in Peoria, was mobilized in 2003 for Operation Iraqi Freedom. On November 12, 2004, Tammy’s UH‐60 Black Hawk helicopter was hit by a rocket-propelled grenade. She lost both legs and partial use of her right arm in the explosion. As a result of her injuries, Tammy was awarded the Purple Heart. Following her injuries, Tammy became an advocate for Veterans. While serving as Director of the Illinois Department of Veterans Affairs in Springfield, she implemented many first in the nation programs to alleviate suffering from Post Traumatic Stress, improve traumatic brain injury screening and reduce homelessness among Veterans. She declined a military medical retirement and continued to drill as a Lieutenant Colonel in Springfield with the Illinois Army National Guard. In 2009, President Obama nominated Tammy to be an Assistant Secretary at the United States Department of Veterans Affairs. There, she headed the department’s effort to end Veteran homelessness and was a leader in initiatives for female Veterans. She also implemented innovative efforts such as creating the Office of Social Media and Online Communications and the Office of Tribal Government Relations. In Congress, Tammy is focused on growing our economy by advocating for small businesses, investing in infrastructure, improving the lives of our Veterans and cutting government waste and fraud. Tammy serves on the House Armed Services and House Oversight and Government Reform Committees. Tammy, her husband Bryan, a Major in the U.S. Army, and their daughter Abigail live in Hoffman Estates, Illinois. Susana Mendoza was sworn in for her second term as Chicago City Clerk on May 18, 2015, and was the first woman ever elected to the Office of the City Clerk. Before City Clerk, Susana Mendoza proudly served six terms as a Democratic member of the Illinois House of Representatives from 2001 to 2011 for the 1st District. Elected in 2000 as the youngest member of the 92nd Illinois General Assembly, she was publicly recognized for her leadership and legislation on social services, education, law enforcement, job creation and animal welfare. State Representative Jehan Gordon-Booth is a Democratic member of the Illinois House of Representatives, representing the 92nd district since 2009. Jehan entered public service by becoming an AmeriCorp VISTA (Volunteer in Service to America) worker at Illinois Central College (ICC). During her tenure, she worked with a variety of faith-based and community-based organizations where she developed relationships and identified funding opportunities for programs benefiting local residents. As a VISTA worker, Jehan assisted in the development of a career-based curriculum for School District 150 and worked to build a partnership between ICC and the Destination Technology program, which increases technology exposure to enhance learning at ICC. Recognizing that the 92nd District is faced with significant economic challenges, Jehan is pursuing an agenda that puts local workers and companies first, and she is working to protect consumers from predatory lenders that lure consumers into loans they can never repay. As the City of Peoria grapples with significant crime issues, Jehan is championing legislation to crack down on sexual predators by requiring lifetime prison sentences for child rapists. With citizens of Illinois and the nation calling for change, Jehan will use her position in the legislature to push for ethics reforms that open up government to the people and ensure transparency with tax dollars. Jehan serves on the House Committees on Access to Federal Funding, Elementary and Secondary Education Appropriations, Human Services Appropriations, Health and Healthcare Disparities, Infrastructure and Veterans’ Affairs. Jehan attends New Morning Star Missionary Baptist Church in Peoria. She is the youngest of eight children of Cleveland and Annie Gordon, a devoted community leader and activist with the Tri-County Urban League for 43 years. State Representative Elizabeth Hernandez is a long-time Cicero community activist, is serving her fourth term as State Representative of the 24th District. Her top legislative priorities have been to crack down on gang violence and crime, create jobs and stimulate the economy, improve educational funding for Cicero and Berwyn schools, increase government openness and transparency, improve childcare, senior and social services, and expand access to quality, affordable health care. Before serving as a state lawmaker, Hernandez worked for former Lt. Gov. Pat Quinn as a Senior Policy Advisor, and before that, Hernandez completed a 17-year career in Cicero Public School District 99, where she managed the district’s multi-million dollar educational grants office. As a legislator, Hernandez has helped pass measures to improve government transparency, increase child care assistance for low-income families, protect victims of domestic violence, provide funding for vital anti-crime programs, and expand access to quality health and dental care. Hernandez has also worked hard with AARP and other senior service providers to revamp the state’s senior services, care for seniors with mental health issues such as hoarding, and provide more money to support in-home care workers. Hernandez is the vice-chair of Illinois Legislative Latino Caucus and member of the Conference of Women Legislators (COWL). Also, Lisa is a member of the Education Caucus, Diabetes Caucus and board member of the Children’s Center, Youth Commission, CYTF, and Hunger Commission. Hernandez was Born in Missouri and raised in Chicago. A single mother at twenty-one, Lisa knows firsthand the challenges of raising a family and staying in the workforce. She also knows the value of persistence, and in 2001 she capped her efforts for a better future by earning a college degree. State Rep. Cynthia Soto utilizes her professional experience and community involvement to represent the people of the 4th District. Throughout her tenure as a state legislator, she has sponsored legislation reflecting her commitment to working families, access to affordable health care, better schools, and safer neighborhoods. Soto has sponsored critical measures designed to assist working families in Illinois. A landmark health care initiative, Family Care, provides health insurance to the working parents of children eligible for the KidCare program. The measure benefits up to 200,000 working parents who do not currently qualify for Medicaid and cannot afford private insurance. Soto is recognized for her efforts in improving health care. In 2013, she co-sponsored a new law that extends Medicaid and takes advantage of federal dollars to provide health coverage to low-income and high-need Illinois residents who are currently uninsured. She also worked to make sure that those who need coverage the most receive it. 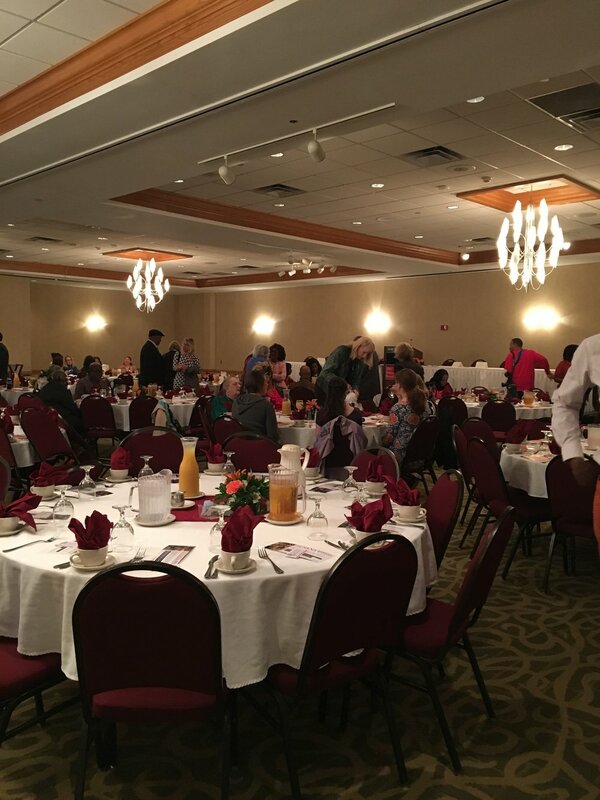 Soto has hosted senior citizen health fairs, such as a Diabetes Awareness workshop, where valuable health and social service information and referrals are provided to residents. Cynthia and her husband have lived on Chicago's Near North Side for more than 30 years. They have three daughters.